The 2018/2019 Fischer Ranger Free 130 was tested in the men's Backcountry category at Silver Mountain Resort by the experts at America's Best Bootfitters, powered by Masterfit. 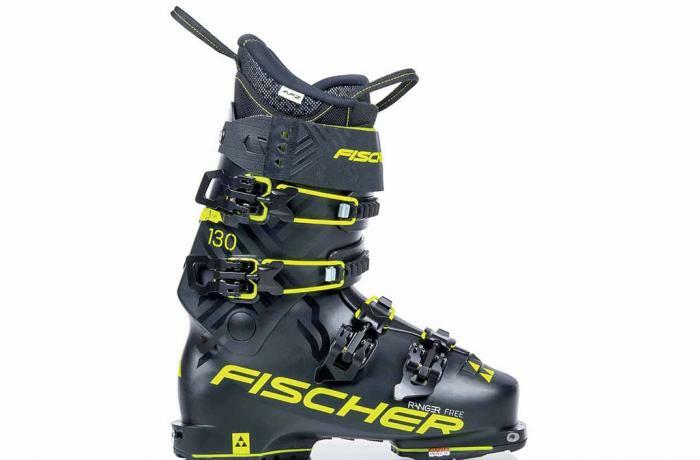 Testers lauded the arrival of the all-new 2019 Fischer Ranger Free 130 twice over, calling it Fischer's pièce de résistance in both the On-Off Area category and also here with the BC boots! The Ranger Free 130 executes on all the elements that make a great Backcountry boot: it's gotta fit well, it's gotta ski great, it's gotta be lightweight, it's gotta have an easy hike mode switch and superior touring range of motion and it's gotta be tech compatible. Check da boxes six times, again! Where to start? When you first pick up the boot you realize it's out of the ordinary. The sleek alpine shape, clean looking buckles and smooth finish set it apart from others in the Backcountry category. The first buckle-up provides a performance fit feel, and then the search for the hike mode switch leads to the discovery of the stealthiest touring flip switch on the market. Barely the size of a beetle wing, a smooth flip of the lever engages a thin interior cable which releases the cuff (will it stand the test of time, a few tester wondered). And then the easy stroll to the skis begins, with long and unhindered strides enabled by friction-free and wide-ranging cuff rotation, both rearward and forward in equal measure. At only 1540 grams it's light enough to compete weight wise with other BC descenders. When veteran testers prepare to on-snow test a boot that weighs so little and walks so well, we naturally ready ourselves for a worthless downhill experience. So, imagine our collective surprise when we find that the Ranger Free 130 absolutely rips! Stable through high speed crud laps, sensitive in untracked pow, commanding to the edge when arcing trenches on piste. Testers couldn't find its performance Achilles heel—though it maintained one hell of a grip on theirs. The Ranger Free 130 comes with GripWalk soles installed, which is where it differs from the other boots we tested in the Backcountry group which have lugged, rockered outsoles and no option to swap soles. However, it's tech compatible with Dynafit fittings and we think tours as well as dedicated BC boots, so we're confident it can bridge both the On-Off Area and Backcountry categories (again, we tested it in both categories this year). Two liner pull loops and a simple Velcro power strap are the extent of the features menu, and we are a little disappointed that there isn't a lateral cuff adjustment, but often those are sacrificed in the name of better cuff rotation in hike mode.